We took a round inside the building that once housed Mahatma Gandhi’s room and now is a museum, Mani Bhavan. When you first turn into Laburnum Road, it may take you aback as it is greener, cleaner and more spacious than most lanes in the city. Walk a little further and along a row of colonial- structured buildings stands the large brown and white mansion in which Gandhiji once resided. Mani Bhavan was the residence of Gandhiji’s friend Revashankar Jagjeevan Jhaveri, and he had stayed in one of the rooms between 1917–1934. The house has now been turned to a museum paying homage to the life of Mahatma Gandhi. The ground and first floors are massive libraries containing books owned and read by Gandhiji, as well as relevant tomes which the museum has collected over time. One is free to go browse the sections on the ground floor and sit down with a book for research. On the first floor, along with a few personal books that belonged to Gandhiji are framed copies of correspondence between Gandhiji and personalities such as President Roosevelt, Adolf Hitler, pages from his journals and front page newspaper clippings from the time of his assasination. 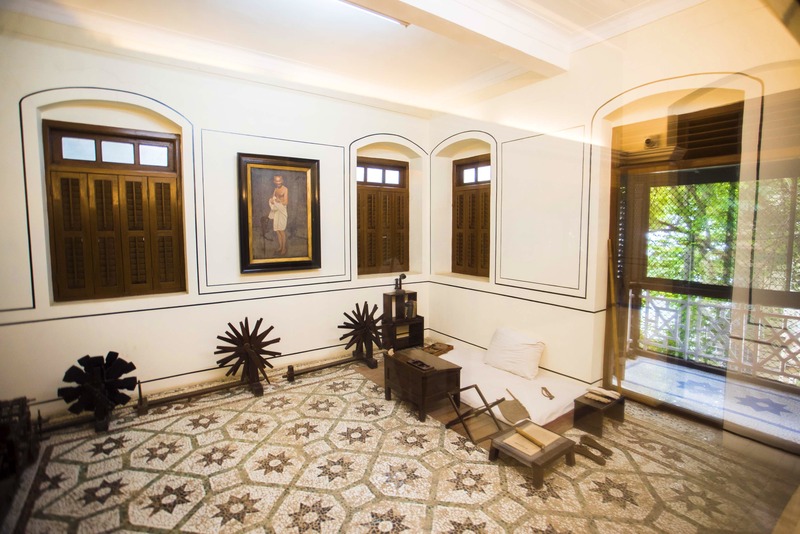 Further up, you will find a recreated set up of Gandhiji’s room on the second floor, with his spinning wheel, mattress and personal belongings such as a simple table with a book, his wooden clog sandals and a hand fan. This room isn’t open for entry but can be viewed through a glass window. This leads to a gallery with some other belongings, clothes and a room full of miniature figures depicting major events in Gandhiji’s life in chronological order. From events such as the bonfire of foreign cloth, Dandi March, salt satyagraha, the Jallianwala Bagh massacre and more. This Gandh Jayanti, why not take a stroll through Mani Bhavan and be transported back in time? The entry is free, and the timings are fixed between 10.30am–6pm although they shut by 5.30pm on most days.